Thorpe Park, located in Chertsey, Surrey, England, UK, was opened in 1979 on the site of what was the Thorpe Park Estate, which had become a concrete producing limestone quarry. The quarry was partially filled with water by the original owners, Ready Mixed Concrete, Ltd., providing for a perfect venue for an aqua-themed amusement park. Upon its opening, which was attended by the infamous Lord Mountbatten shortly before he was killed, the park was small. Some of the first attractions to open at the park included the Cinema 180, a type of cinema very popular at the time, the Mountbatten Pavilion (later Port Atlantis/the Dome), Magic Mill and Phantom Fantasia, classic dark rides both of which were later destroyed by a fire, a WWI Aircraft Display and the Schneider Trophy Aircraft Exhibition, some nature trails, and a railway. In 1983, the park opened its first roller coaster, Space Station Zero. The park steadily began to add rides and in 1986 opened Teacup Twisters, followed by a river rapids ride named Thunder River. A lavish Palladium Theatre was joined by a rethemed Space Station Zero now known as Flying Fish in 1990. In 1995, construction began on the ultimately disappointing X:/No Way Out. This ride never lived up to expectations. However, the park was still voted most parent/family friendly in the United Kingdom in 1996-1997! The current era of expansion and conversion to a true thrill park began with the purchase of the park in 1998 by Tussauds Group and then in 2007 by Merlin Entertainment. It was at this point that an ancestor to today's LoQ system was introduced at Thorpe Park. In 1999 a new film called Pirates 4D was introduced with vibrating seats and numerous air and water effects. Thunder River was also rethemed to Ribena Rumba Rapids. In 2001, construction of the brand new record breaking Colossus coaster was begun. The Intamin looping coaster opened in 2002 with great fanfare as the first 10-looping coaster ever. With this massive expansion Thorpe Park was christened #1 in the United Kingdom for the first time. 2003 brought even more amazing thrills on the table with the opening of the brand new inverted mega-looper from Bolliger and Mabillard, Nemesis Inferno themed to a blazing volcano. In 2005 the park added two unique flat rides to the park from S&S; Rush, being Europe's only Screamin' Swing and Slammer, Europe's only SkySwatter. But get ready because the park was ready to add coasters galore! 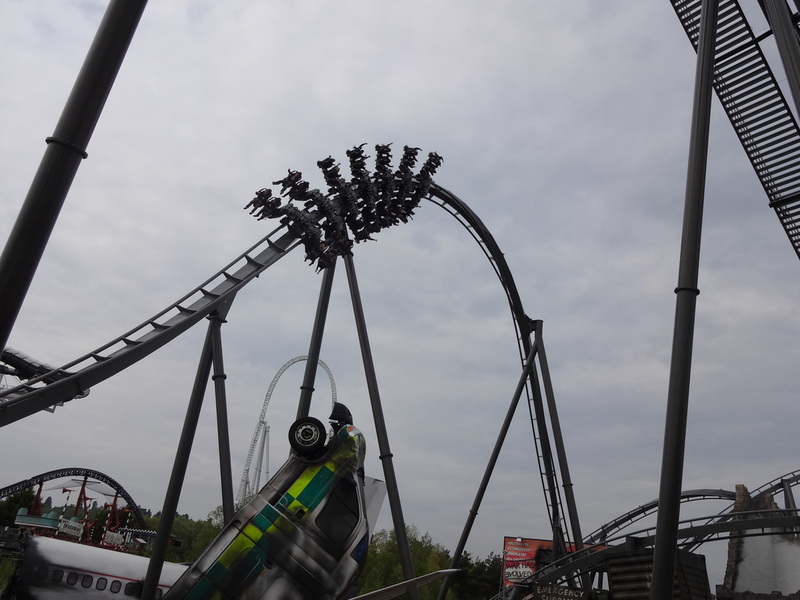 In 2006, an accelerator coaster from Intamin called Stealth was added to the park along with a Gerstlauer Eurofighter model roller coaster called SAW: The Ride in 2009. In 2010, a live action horror maze was added to enhance the SAW experience. In 2012, once again the park would add another coaster. This time, they would turn to Bollinger and Mabillard who would design a wing model which would take on the moniker Swarm. In 2013, the park would turn the two back rows of each train backwards and add a billboard element to the track for a near miss head chopper effect. These coaster editions plus other refurbishments to the existing coasters such as rebranding X:/No Way Out to X make for exciting times for coaster enthusiasts. In 2014, the park opened a new themed area, Angry Birds, which adds to their six other themed areas. They also opened a new hotel called Thorpe Shark Hotel! Thorpe Park has rapidly evolved into a thrill seekers paradise for British and world-wide coaster enthusiasts. With quality coasters unique flat rides, Thorpe Park will continue to wow enthusiasts for years to come.